When you were in art school, you were always attracted to colors found in nature, and things with a natural aesthetic. After you graduated and bought a home, you decided that the bottom floor needed a change, and you wanted to start with the flooring. Keeping you art school ideals in mind, you set out on the search for the perfect tile and your search ended when you came across Golden Sienna travertine tile. The gold, cream, mocha and honey colored tones found in the travertine are reminiscent of those found in nature and the veins throughout give your tile visual interest. The tile is completed with a tumbled finish, giving it a somewhat matte appearance. After the flooring has been installed, your home looks completely transformed and you couldn't be happier with your new Golden Sienna travertine tile. 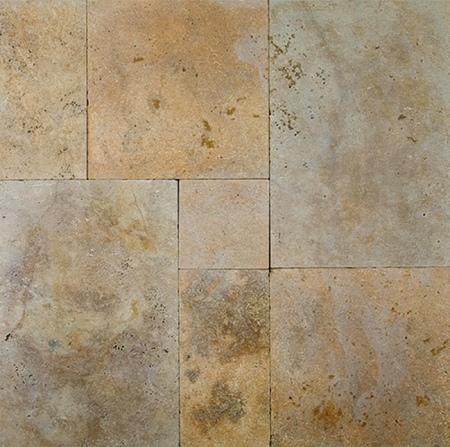 Golden Sienna tumbled travertine is ideal for both residential and commercial use. It works well for floors, walls, counter tops and shower walls. Purchased for a big project. Can't say enough about the quality and service.